Old Blush Heirloom Rose (rosa chinensis)- One of the best antique rose bushes for continuous carefree blooms. Very disease resistant and drought tolerant once established. While not particularly fragrant, this old reliable beauty will reward you with loads of soft pink flowers over a long blooming period with very little care. 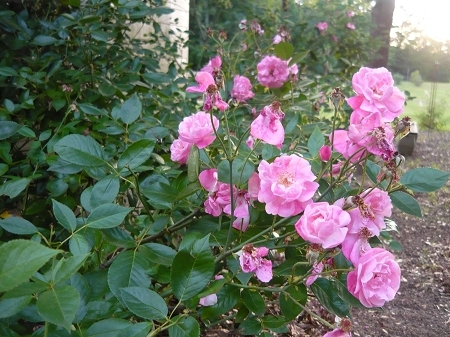 Does particularly well in the hot humid south where other roses can be difficult to grow. Can form a bush 6' x 6'. Perennial zones 6-10. Live plant in 3 inch container.